Artistic wall lights and illuminated door handles make their debut in Martin Pierce's new Spring collection.Colorful LED lights take center stage in this collection of custom door handles and mark the company's move into the arena of luxury wall lights. These low voltage collections are available to designers and architects. The Dragon Egg wall sconce was named after the “Game of thrones” and is really a tribute to the dragon eggs rescued from the flames by the Mother of Dragons. 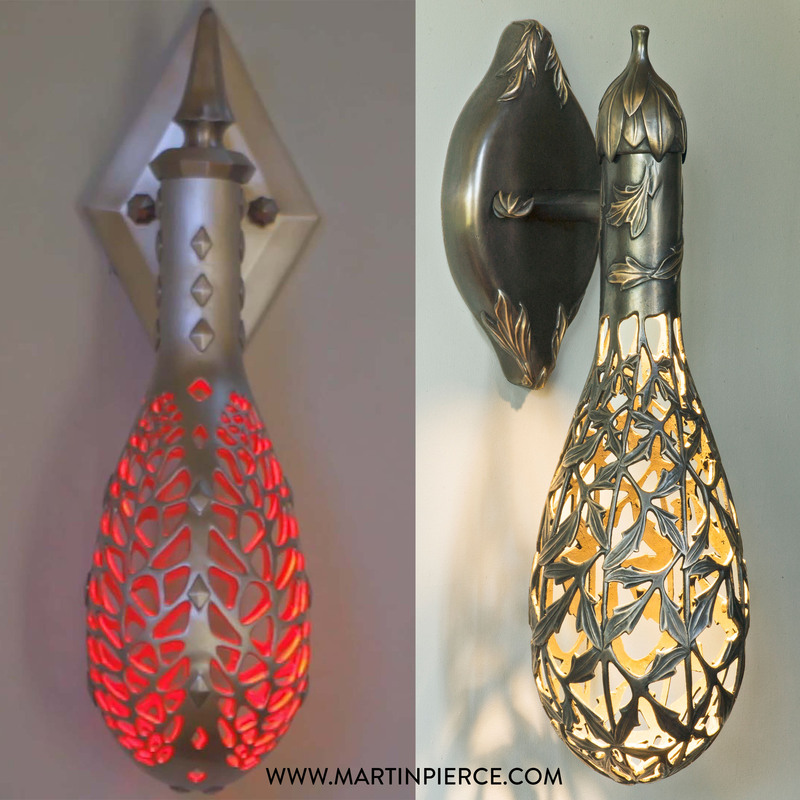 Martin Pierce is now taking his artistry and craftsmanship and applying these talents to creating distinctive wall lights. Three distinctive but complimentary themes form the basis of this new collection of low voltage wall lights debuting in March 2017. While all of Pierce’s work has an earthy organic sensibility, the inspiration for each sconce was quite specific. When asked about the inspiration for his Dragon Egg wall sconce Pierce admitted that it, “was named tongue in cheek after the Mother of Dragons in Game of thrones and in tribute to the dragon eggs she rescues”. The gourd shape of this sconce may be egg like in outline but the fretted lace filigree when cast in stainless steel gives it a futuristic feel. For his Floral style sconce, Pierce looked to the flora and local artistry of Granada, Spain which he had recently visited. Granada, while steeped in Moorish art work still has a thriving community of artisans and Pierce was intrigued by the work of Munira Mendonca, a respected leather craftsman who incorporates geometric shapes into her embossed leather designs. The geometry of this regional art is reflected in Pierce’s use of a 3 leaf sprig which is repeated in his bronze casting a total of 60 times and which creates a wonderful pattern of fragmented light. The advent of small low voltage lights is also being used by Pierce to add color and light to his door handle collections. According to Pierce, this new technology has, “helped blur the line between door handles and door lighting and the small gauge of these low voltage wires makes it easier to hard wire these hybrid fixtures.” As Pierce puts it, “ If you can wire your front door for an electric lock, then why not for a color changing door handle?” While it is obviously easier to design a new door with wiring in mind, existing doors can work for this new technology if there is a channel in the door frame or a means of creating one. Power is then delivered to the door through an electric hinge or other energy transfer device and the result is a colorful artistic door handle that will not need to be charged. It seems only fitting that Pierce turned to the new technology of 3D printing to help create his master patterns for both his Dragon Egg and Floral designs. The first pattern was made old style by Pierce who turned the gourd shape on a wood lathe. Departing from tradition, the gourd pattern was then mapped by a 3D scanner and a 3D print was made. The advantage to 3D printing was that Pierce could print the second pattern as a hollow shell. In fact two hollow shells were printed, one for his Dragon Egg sconce, the other for his Floral sconce. Pierce then hand carved each design making artistic changes as needed. "The beauty of 3D printing is that it reduces the grunt work of hollowing out patterns and leaves me fresher to carve, a task I really enjoy." The third sconce in this collection follows in the style of Pierce’s Morphic door handles and has an oceanic Gaudi feel. All of this company’s work is designed and made in Los Angeles using the lost wax method of casting and is cast in investment grade bronze or stainless steel.